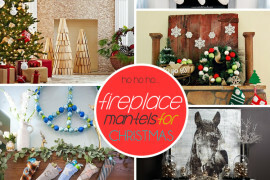 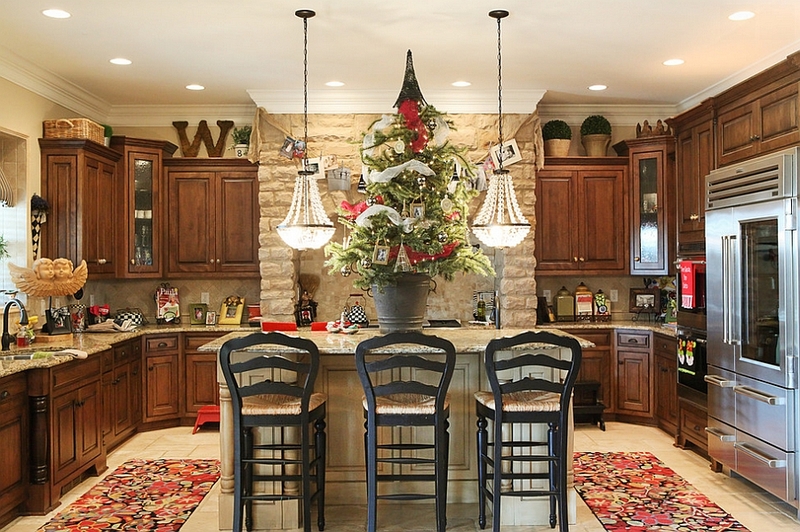 Are you already busy frantically prepping your home for the festivities ahead? 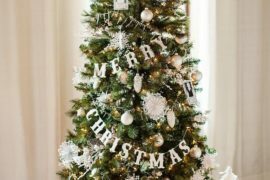 With Christmas just over a week away, now is the time to deck your home with those shiny ornaments, gorgeous decorations, and of course, the grand Christmas tree. 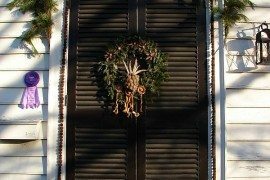 Yet, as each year we delve into the magic of the holiday season and all the fun that it brings, somehow many of us forget about the heart and soul of the house! 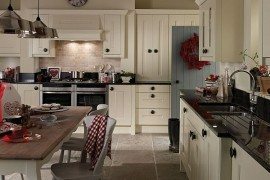 The modern kitchen is increasingly becoming a natural extension of the living space, and it makes sense to fill it with Christmas cheer, even as we make plans for decorating the living room and the front porch. 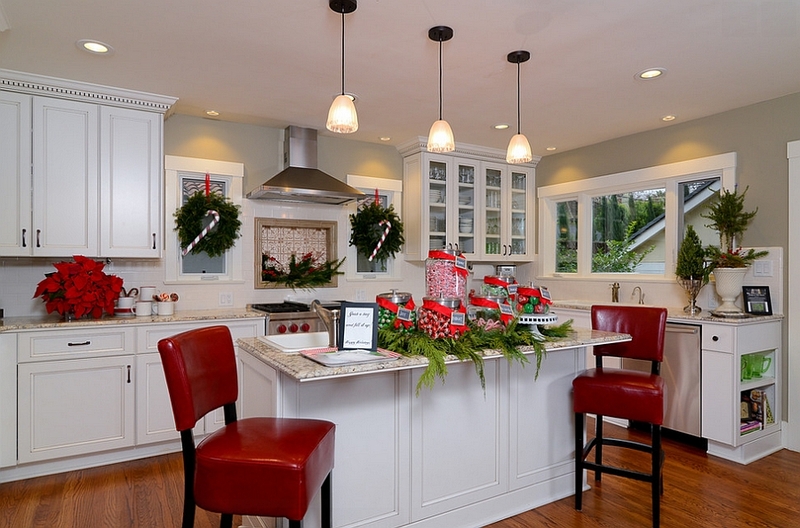 Christmas kitchen decorating ideas vary from the expansive to the subtle, and you can pick a color scheme, theme and style of your choice. 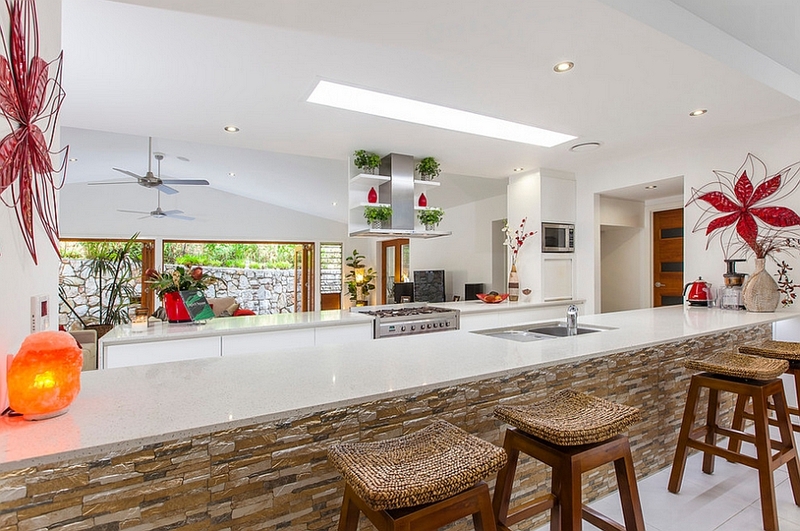 It does not really take a whole lot of effort, and if you have a large dining space that is connected with the kitchen, it becomes even easier and far more impressive. 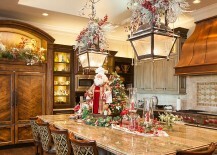 So why not spread some Christmas joy into the kitchen as well this year? 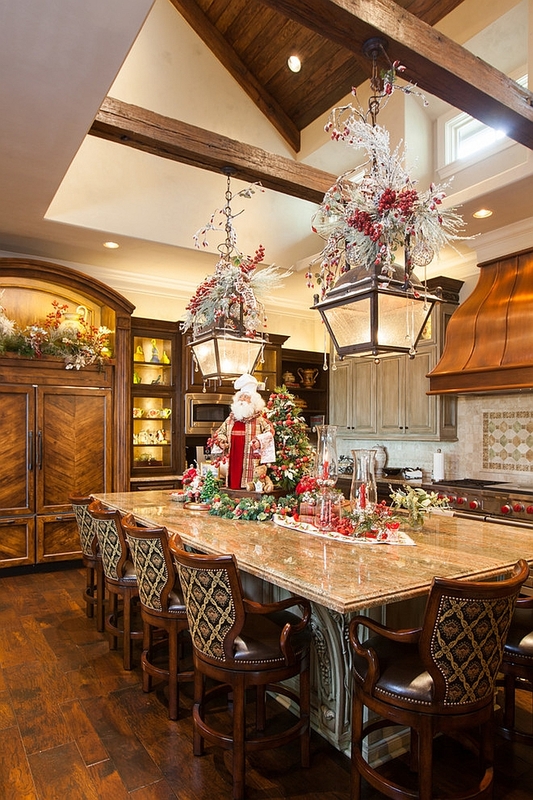 Decorating the kitchen with Christmas ornaments does not mean filling it up with baubles or completely draping it in red, green and white. 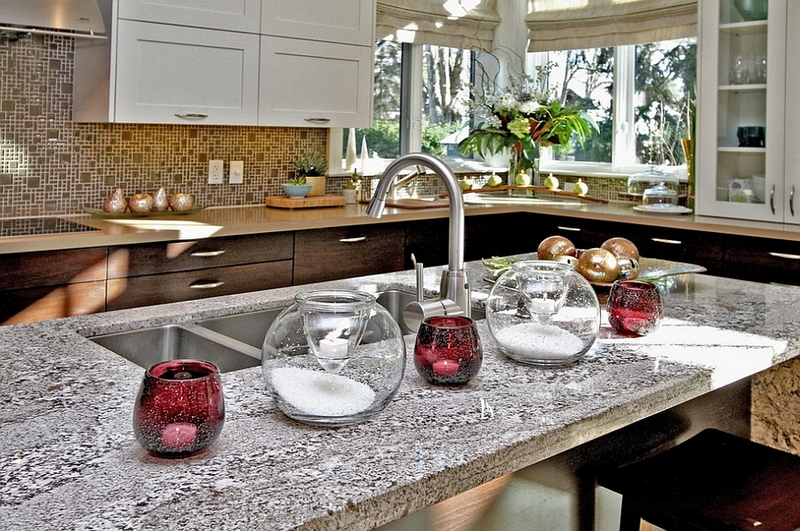 Instead, use the existing color scheme of your contemporary kitchen to your advantage. 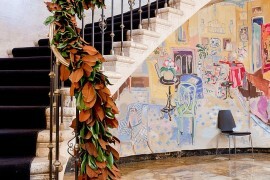 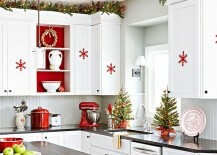 If it has a neutral backdrop, then all you need is splashes of red and green to usher in some festive charm. 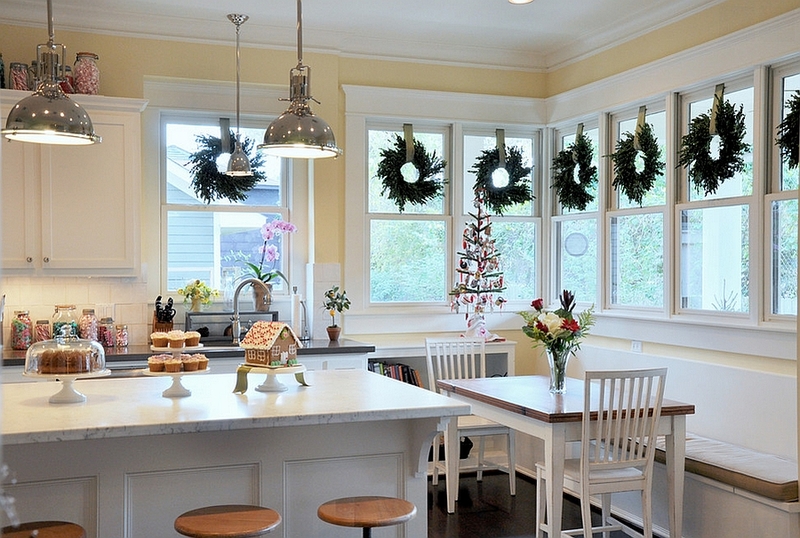 Make use of the vertical space on offer and hang lovely wreaths that instantly become focal points of the room and spread holiday cheer. 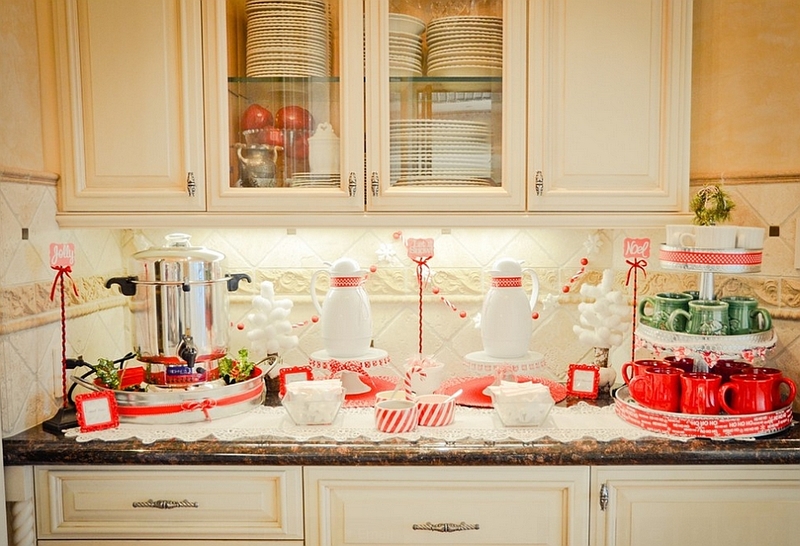 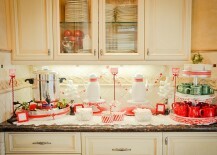 Kitchen utensils and chinaware in red and green also add to the overall appeal of a Christmas-themed kitchen. 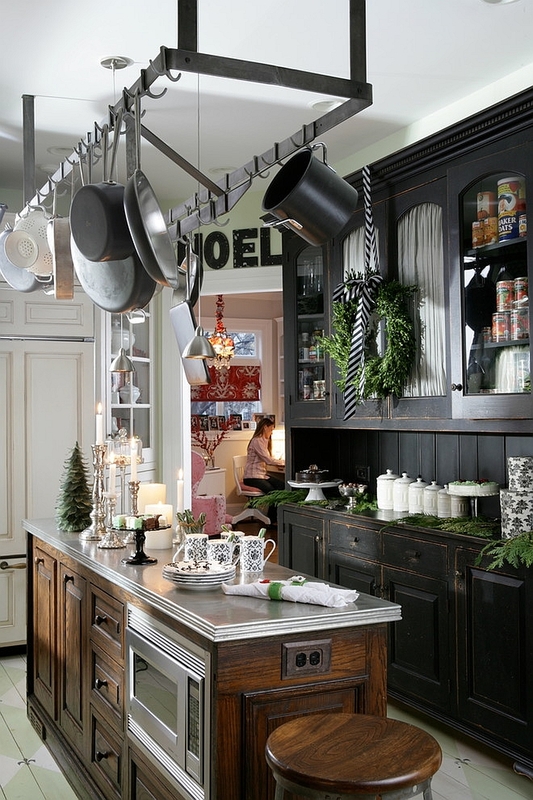 Use the space available on top of the wall-mounted cabinets to add natural greenery and string lights to quickly alter the ambiance of the room. 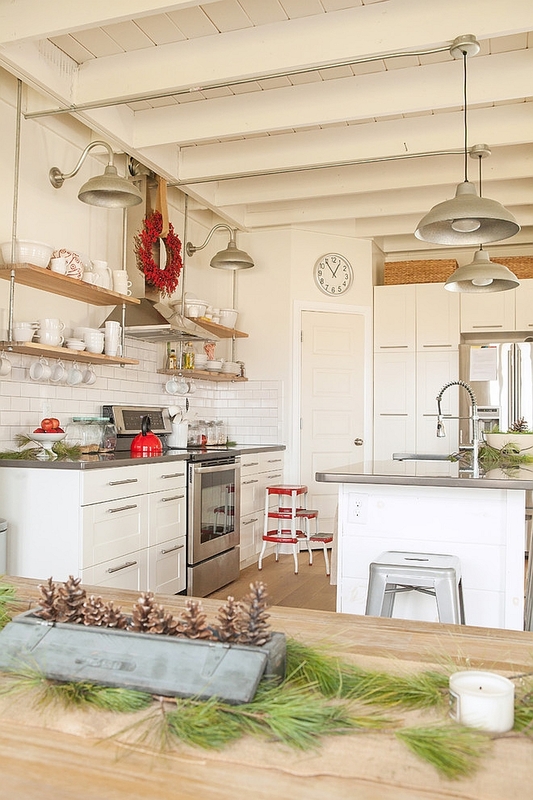 Creative use of string lights allows you to give the kitchen that merry vibe without actually altering the functionality or the space available in the kitchen. 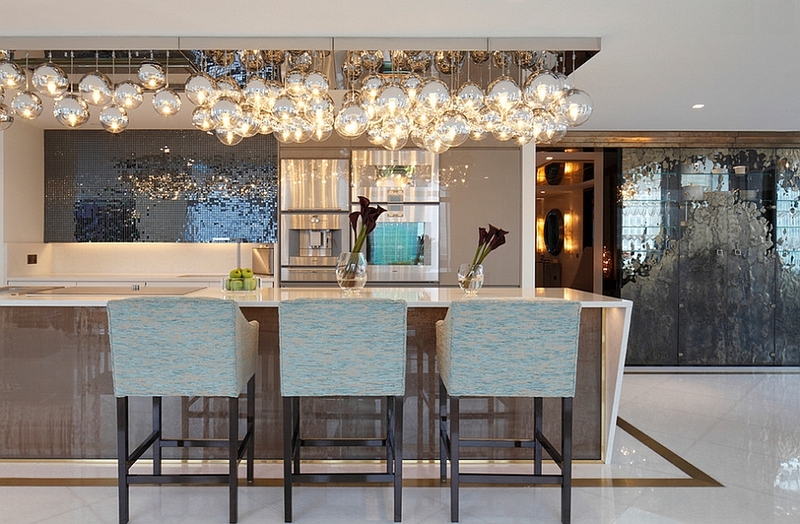 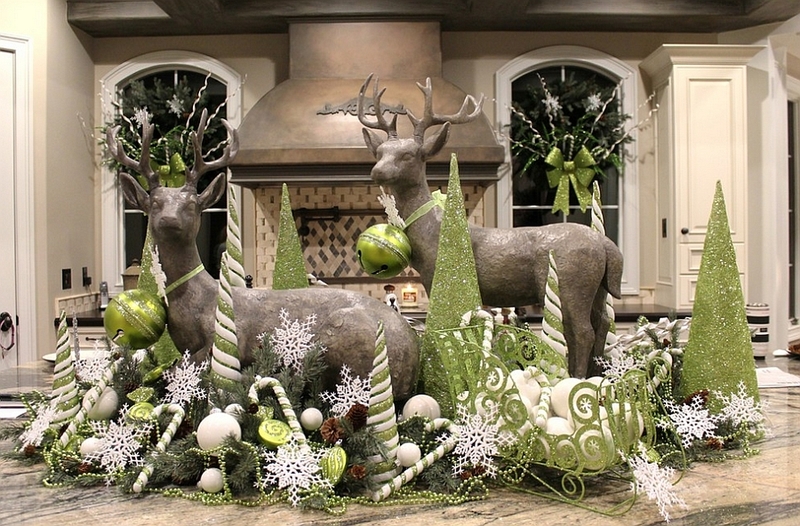 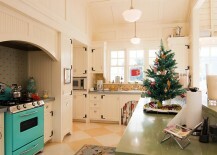 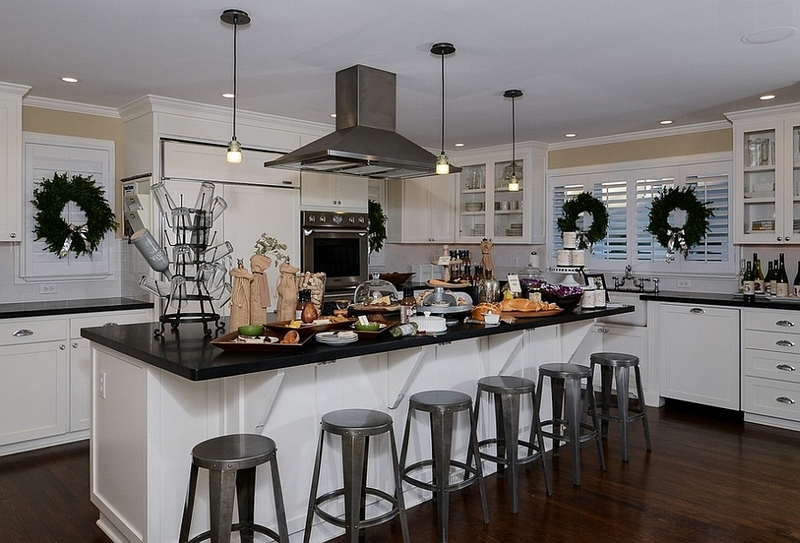 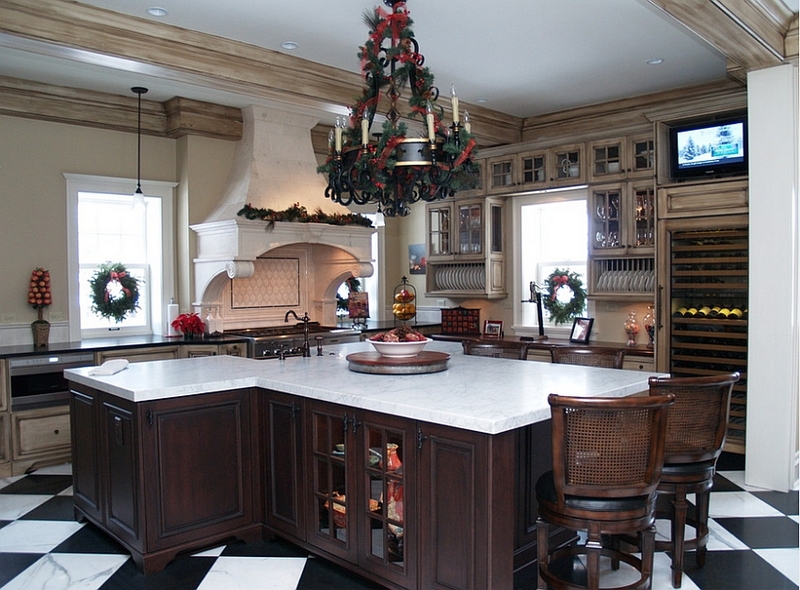 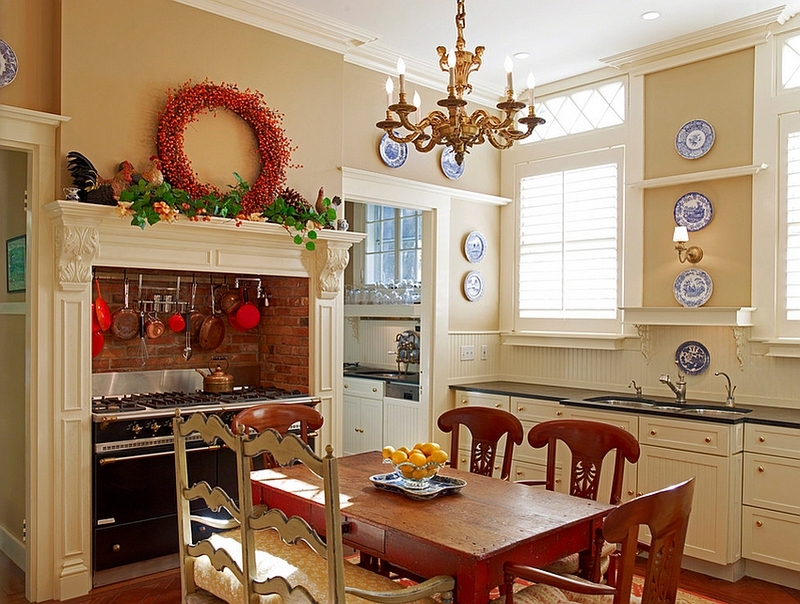 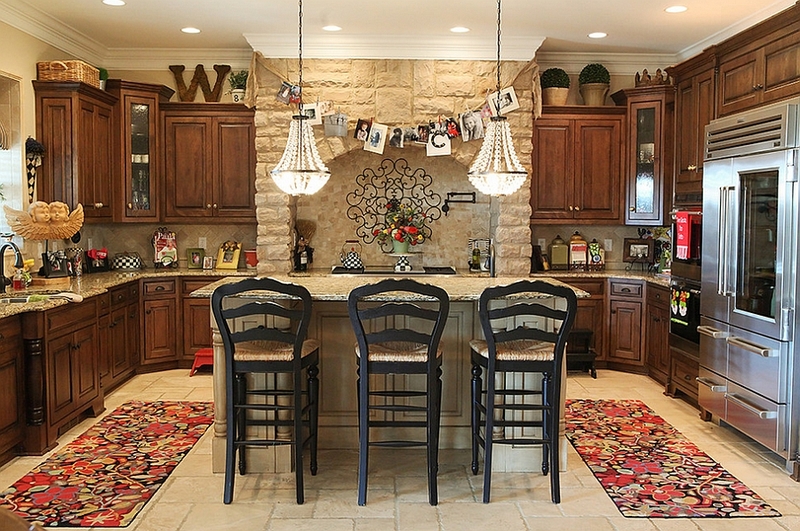 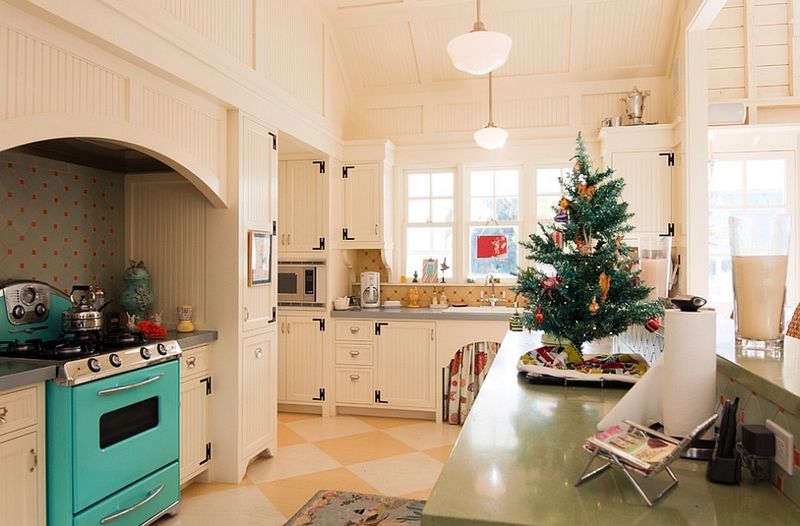 Kitchens filled with Christmas allure are not just for those with modern kitchens alone. 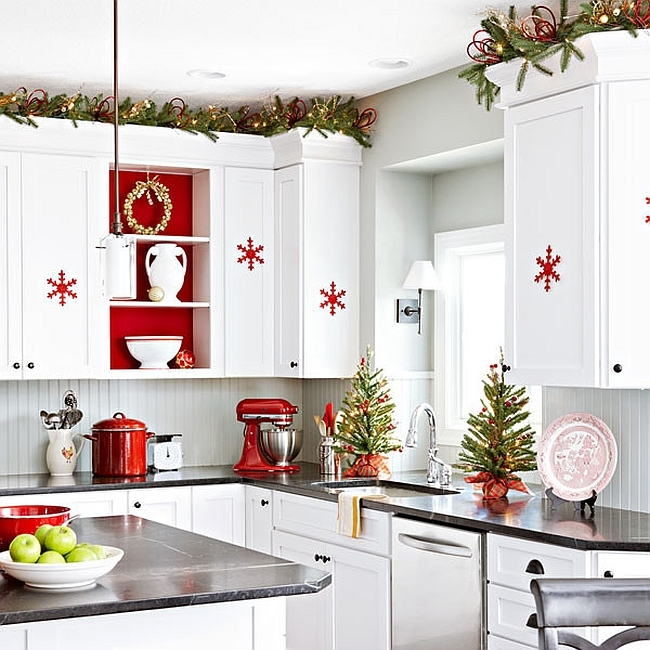 In fact, traditional, rustic, farmhouse and transitional kitchens embrace the classic Christmas adornments and ornaments with greater pomp and visual splendor. 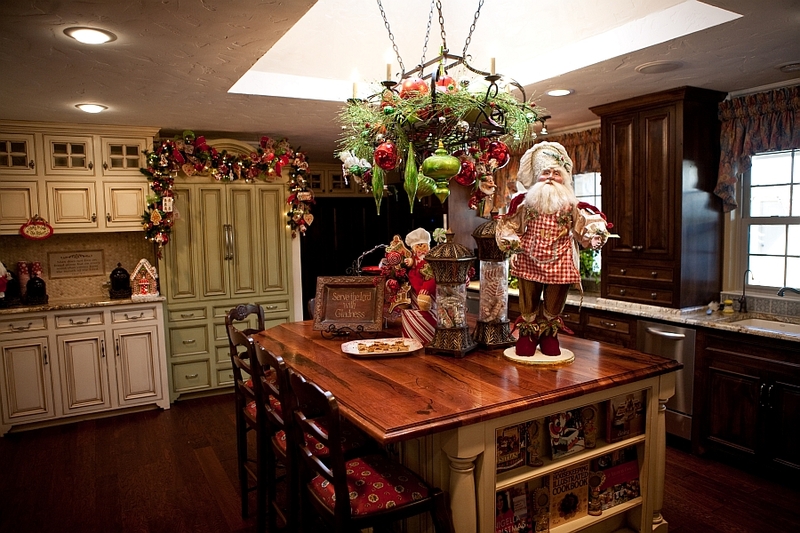 Place a cool Santa figurine on the kitchen island and surround it with shiny baubles or bring in a small Christmas tree and fill out the empty corner; there are plenty of possibilities if you are willing to think out-of-the-box. 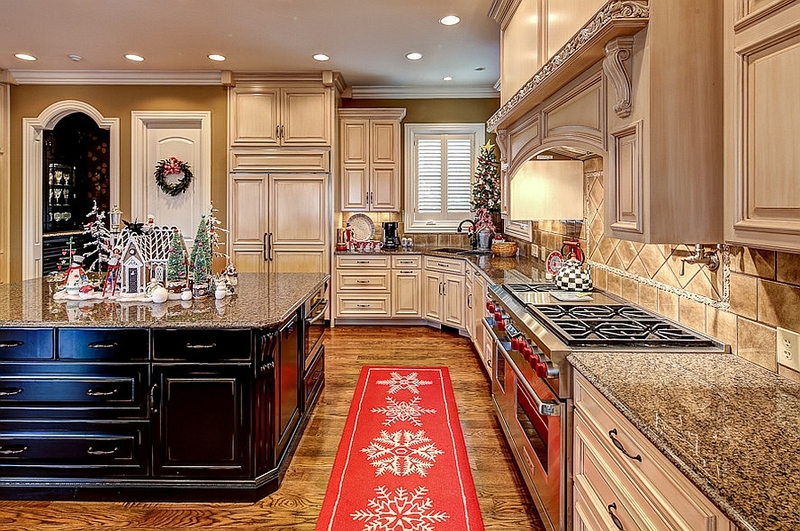 Carpets and rugs with Christmas motifs, window curtains, lovely drapes and carefully decorated chandeliers can all be used to usher in a classic and timeless atmosphere. 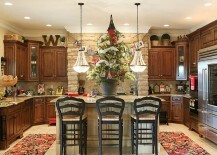 Bringing holiday cheer to the kitchen is pretty easy, and you can do it without committing to any long term changes. 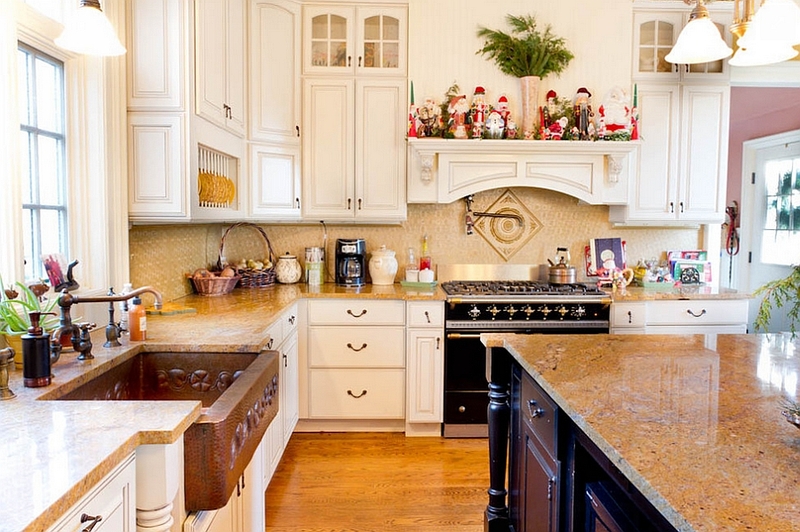 Just clear some central space on the kitchen island and fill it with holiday decorations, small figurines and glittering ornaments to quickly shape an impressive festive island. 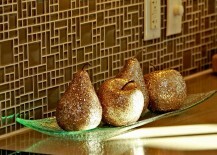 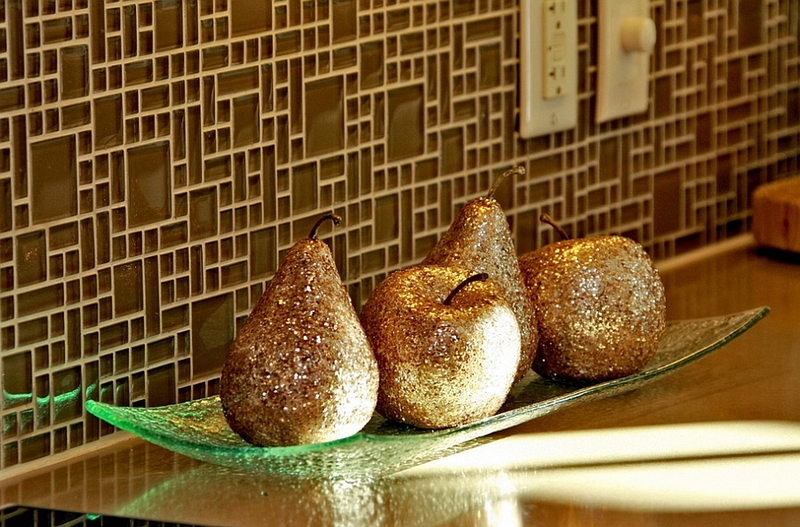 Faux fruits with golden glitter are also becoming pretty popular as holiday decor, and you can even use these well beyond the season. 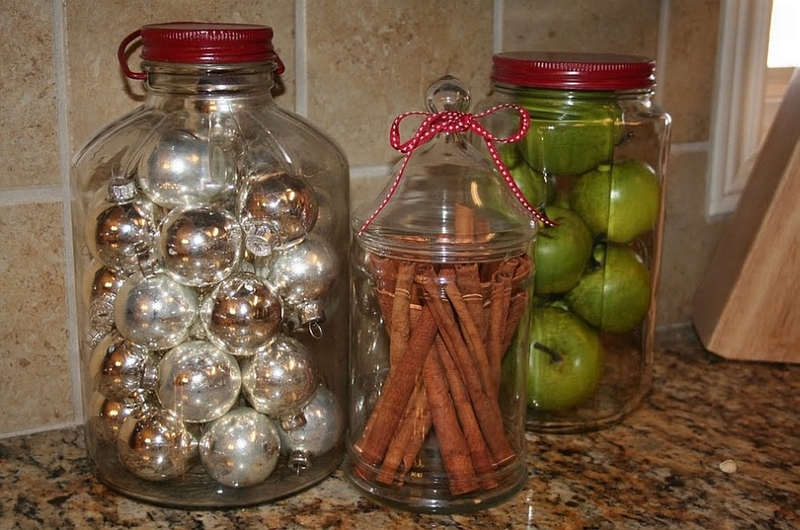 Fill up those old mason jars with candy canes, hand-blown baubles and other shiny ornaments, and add them to the open kitchen shelves for a quick makeover. 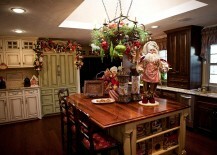 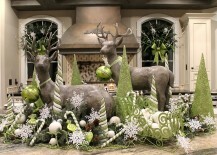 Decorating the kitchen for Christmas is not as hard or time consuming as decorating the living room. 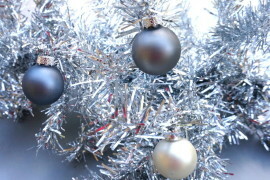 You will also not need any extra supplies, and you can simply siphon off a few that would otherwise be used in the bedroom, dining space, living room, or out in the yard. 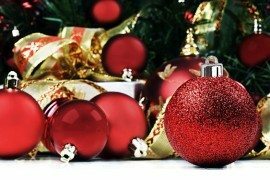 Give it a shot this year and you will quickly fall in love with it all!